Just in time for RavenCon 2018, I’ve added FIVE titles to the shelves. Two of them should be arriving this week, the other three are already listed on our Amazon shop and are on the table at Retro Daddio’s. I’ll start with the latter first. WARNING: Some of the links lead to troubling videos and articles. I’ve put a star next to those, just in case you’re not in a good place for hard-to-see information right now. Dress Like A Woman: Working Women and What They Wore, by Vanessa Friedman and Roxanne Gay, is a stunning overview of what women have worn to work over the past century. Light on text and heavy on gorgeous photos, the array of outfits and the accompanying context notes left me feeling both astonished and deeply proud of what women have accomplished. It’s one thing to know that women have worked in every possible field, overcoming barriers right, left, and center: to see it in full color, to see their faces … is just breathtaking. Pride and joy is on full display, interspersed with stolid “yeah, so?” expressions and even an occasional look of “get that damn camera out of here so I can get back to work”. I found myself newly determined to “git ‘er done” as these women have done, no excuses, just get to work. For those who need a cheaper version, the ebook is just as gorgeous as the hardcover. So You Want To Talk About Race, by Ijeoma Oluo, is an absolute must-read for anyone ready to confront the vast shitstain of racism in American society. And actually, even if you’re not, you ought to read this book anyway–because nobody’s waiting for you to be ready. We’re all in the middle on a longstanding, ongoing, and expanding mess. Get involved. At the very least, get informed. Oluo is an excellent source for that information. She has a way of delivering reality that both bypasses and shatters the “I’m not racist!” armor so many of us wear. I follow her on Twitter (@IjeomaOluo), and strongly suggest you do as well. 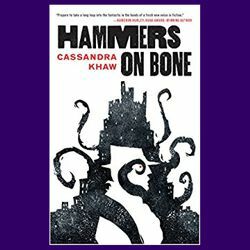 Moving back to books: I’m currently waiting on the arrival of two more books: The Only Harmless Great Thing by Brooke Bolander and Hammers on Bone by Cassandra Khaw. Technically, Hammers on Bone is a refill, not a new item, but my first batch sold out so fast it might as well still be new. I’ve put up an author page for Khaw; take a look at it, and follow the links provided to her excellent short fiction. I’m on record as loving almost everything Khaw has written to date. Her Rupert Wong books aren’t quite to my … err … taste, but there’s no question that the writing is utterly gorgeous. Her grasp of horror kicks Lovecraft, Lansdale, and, dare I say, Bradbury to the curb. In Hammers on Bone, a demonic detective is approached by a desperate kid who needs help with a domestic problem. Specifically, the kid wants to kill his stepfather. And he has a damned (ahem) good reason…. Last but not least, Brooke Bolander’s debut novel, The Only Harmless Great Thing, absolutely grabs and kicks the reader the whole way through. It’s a gorgeously written story. Bolander has combined two true things: the *Radium Girls and the *electrocution of an elephant (both of which occurred during the early 20th century), and created an unearthly tale of desperation and rage, greed and injustice, that serves up a sharp reminder that even today, “regulations are written in blood”. Loosen the laws, look the other way, and people … not just humans, but people … die. It’s not a cheerful book, but it is an important one. The questions it raises will haunt the reader, and perhaps make us all take a harder look at the things we’ve been trying not to see happening around us. Bolander is on my short list at this point; I’m very interested indeed to see what she produces in the coming years. That’s not the most cheerful note on which to end this update, so let me take a sharp turn sideways to more amusing and yet still strange items. Visitors to the Detroit Zoo recently had a chance to walk out with buckets of “zoo poo” … great for your garden, and hey, what a story to tell your neighbors as well! Unusual Cookbooks. From The Decadent Cannibal’s Cookbook to Entertaining With Insects. Yum … ?